I honestly think that the reason my blog doesn’t have a name, or a declared area of interest, is that whatever I’m supposed to be writing about, I’m drawn to writing about something else entirely. Right now, my every working day is social media-tastic, as I get stuck in to a whole new world of community management. So, what do I feel drawn to write about? Playing pirates with my 2.5 year old daughter. It started, as so many things do, with an Amazon delivery and a cardboard box. I ordered a birthday gift for my husband, a hot water bottle (so twee, I die) and a pair of bed socks, because our house is really freakin’ cold at the moment and anything that doesn’t make the electricity meter spin round frantically is a good thing. I opened the box a little before bedtime, as Ramona was having a suppertime snack, and she immediately beat the cat to vaulting into the box. To cut a long story short, bedtime was only achieved without a fuss when I promised said box could actually be decorated as a pirate ship in the morning. But then her dad and I decided to get a little more elaborate. We realised we had loads of drawing stuff, but not enough crafting gear, so a quick and cheap trip to a local supermarket netted some child-safe scissors and glue, and flimsy construction paper plus pirate treasure (chocolate Easter chicks). We always have tonnes of newspaper and kitchen roll, and the Amazon box had come padded with brown paper. We’d been given the bare bones of the story by Ramona, so we got to work. An old bed sheet and two chairs became the camp. 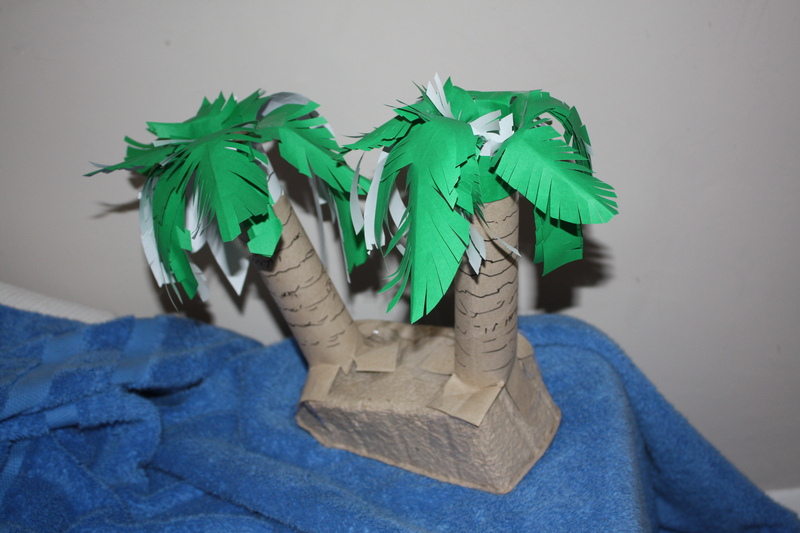 A couple of kitchen roll tubes and some artfully snipped green paper became palm trees, stuck on an old card veg box and popped on a blue towel. A map was poorly hastily drawn on some brown paper. A biscuit tin was filled with brown paper and dotted with ‘jewels’ (a plastic Peppa Pig set someone gave her a few weeks ago) and ‘gold’ (a few of those chicks). It was promptly hidden under a piece of furniture. Finally, the box was popped on some newspaper on the floor, and we got out the arts and crafts stuff. So, when she woke up this morning, for the first two hours of the day, we played pirates. We decorated the ship, carefully applying as much paint as possible to our hands, feet and the carpet (then had to leave it to dry, but it’ll be ready for next time) found the map, got in the fort, had a pretend nap, went from room to room hunting for treasure, found the treasure, ate a very small amount of treasure, re-hid the treasure at least three times, and then had a pretend picnic with our special guests Rosie the Bear, Elliot the Dragon, Rudolph (three guesses) and Snuggle Bunny. Also the “blue guest, I don’t know his name” which turned out to be my ancient Wacko soft toy from Animaniacs. After a break for breakfast, Mummy’s bath etc, we had a real lunch picnic with all our guests (we’re clearly too polite, as pirates, to have prisoners – we just invite everyone to our camp for nibbles). I hold my hands up to being someone with good intentions but a weakness to just falling back on the TV or endless re-readings of Hairy Maclary, and it was so nice to find a way for us both to indulge in some enjoyable make believe, with virtually no budget or fuss required – provided one doesn’t really care about a messy house. For the record, I don’t. At all. After three exhilarating but exhausting weeks of trying to adjust to a new routine and work out which end is up, it was maybe the best way I could think of to spend my time. And she loved it too. Next Post → Disney Parks Announcement Bingo: Play Along at Home! Ahh messy play is fun – esp painting. Looks brilliant fun! Thanks for linking up to our Parenting Pin-it Party. Thanks for commenting and setting it all up – great idea!